Frist of all you have to upgrade your Airtel sim into 4g . Go to your nearest Airtel office and upgrade your sim there. 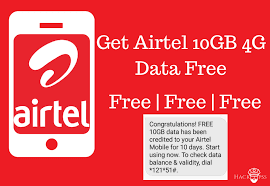 Then give a miss call on 5999555 from your Airtel mobile number then you get a confirmation SMS on your mobile number . After that you get a 10 GB free data instantly on your mobile numer. This offer available only 4g sim. This offer expires on Nov 2018.